It's been a while since I shared any food. Here's something delicious and healthy you can make in a wok. It starts with fresh salmon fillet, skin on (of course -- that's where much goodness is). OK, so I'm a bit vague with amounts. I made dinner for two but you might be serving more. Be sure the marinade can soak the fish as that's the whole point. Otherwise, make more sauce or use a more appropriate bowl. Marinade salmon fillets for a minimum of 15 minutes, spooning mix over the fillets regularly. I do this while preparing the remainder of the ingredients. I choose these based on availability, freshness, texture and colour, to get a nice balance. The look and mouth feel are important, alongside flavour. 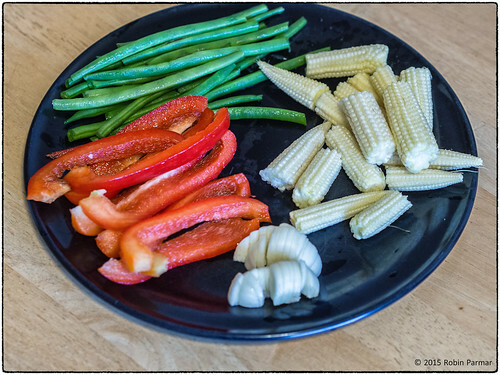 On this occasion I used baby corn (yellow), string beans (green), cabbage (white), and peppers (red). Plus one garlic head. Susannah picked these out from the grocery store on the day, and they were all super fresh! The cabbage (not pictured) was a sweetheart variety, which is absolutely my favourite for flavour and texture. Cabbage is a totally authentic Chinese ingredient, though it's not seen much in fast-food versions of the cuisine. I guess because people think it's cheap and uninteresting. They are wrong! If the head is small, I'd use the whole thing. It may fill an entire bowl when raw, but will reduce in volume during cooking. 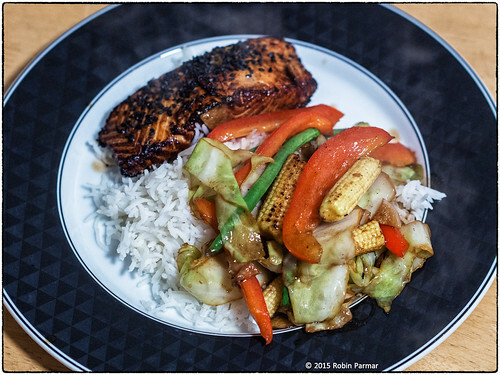 How do you chop vegetables for a stir-fry? That is an art in itself. There are two goals. First, each piece should be bite-sized, so you don't need a knife to eat. Second, each vegetable should need roughly the same amount of cooking. Every piece should still be crunchy when hot. A note about garlic. If you have a garlic press, throw it away. If your recipe book says to "dice finely" then throw it away too. Garlic should be treated as any other vegetable in the stir-fry. It needs only to be sliced. I never place it in the pan first and cook to death, like many recipes advise. In fact, it needs less cooking than something fibrous like corn, and so goes in the wok afterwards. OK, so all your veg should be prepared. 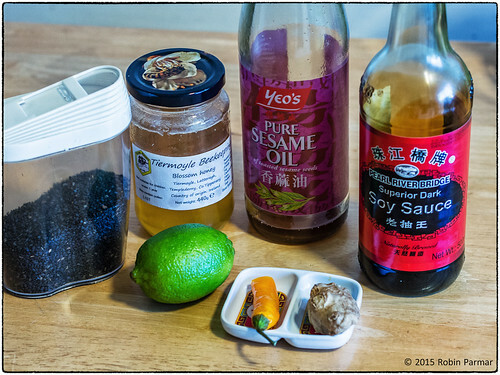 When I make a stir-fry, every ingredient must be ready to go before I start to cook anything in the wok. 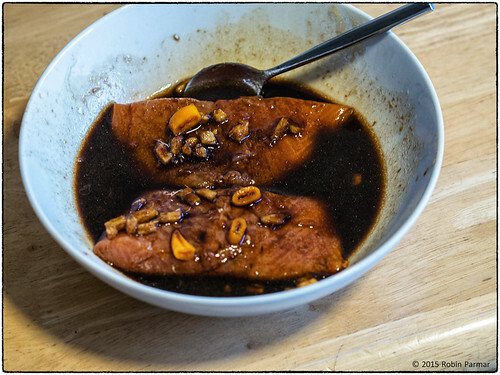 Remove the salmon pieces from the marinade and stir-fry in hot oil. Do not jostle or handle unnecessarily. Turn exactly once. This preserves the texture of the fish. Cook for two minutes per side. That's all it needs when the wok is super hot. When done, place onto kitchen roll (AKA paper towel) but do not pat down. Just let it sit. Sprinkle with black sesame seed. First in the wok were the beans and corn, since these take the most cooking time. Then the cabbage since I like to cook it down a bit. Then garlic, then red pepper. Yep, garlic second to last. I don't cover the veg when cooking. I simply keep mixing every 15 seconds. When almost done, add the reserved marinade mixture and stir for a final 15 seconds. Serve with rice or noodles as you wish. Enjoy!